“Suddenly, a [canon] shell screamed though the [hotel] building, slicing the top off the piano and sending splinters flying.” This was New Smyrna in July 1863, yet I was told in school that Volusia had no Civil War battles. 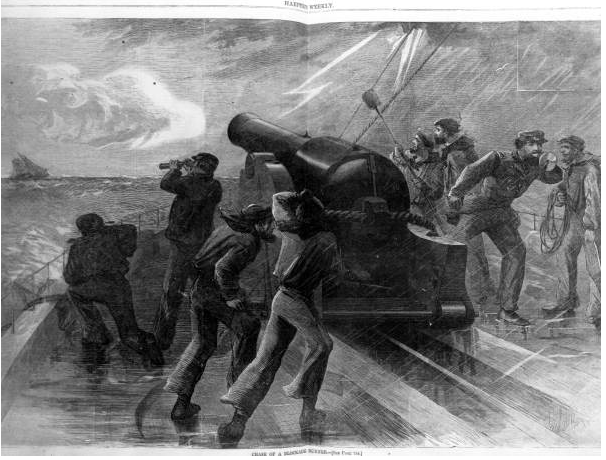 Sixteen months earlier in March 1862, six Union small boats loaded with 44 men, weapons, and a howitzer (probably a 12-pounder) raided New Smyrna and Oak Hill, destroying salt works, before attempting to clear the area of any Confederates. Instead, they were surprised in ambush. No Confederates died, but eight Union sailors were killed, including the two officers; and 30 others were wounded, so nearly all the Union troops were casualties of this raiding expedition into New Smyrna. Yet I was told that the Civil War was not fought in Volusia. Union troops also attacked the areas around Astor, and DeLeon Springs, Enterprise, and even Lake Harney. New Smyrna, Oak Hill, and the Dunlawton (Port Orange) areas were major suppliers of salt to the Confederacy, and I had not learned in school that salt was vital. I didn’t know that salt was necessary for tanning hides to make rifle slings, cartridge boxes, musket cap pouches, primer belts, saber belts, bayonet scabbards and throgs, revolver holsters, leather gauntlets and officers’ gloves, artillerymen’s haversacks, leather brogan shoes, cavalry boots, leather shoe laces, leather suspenders, spur straps, harnesses, saddles, bridles, halters, wagon reins, and many other war items. All of which were manufactured with salt, likely provided by Volusia County. Salt in Volusia was made by boiling seawater in huge kettles until all the water was gone, and it was so valuable that it cost more per pound than cotton. Salt was also vital for preserving beef (this was before refrigerators). It was so important that although the Confederacy ordered the drafting of all able-bodied men, 5,000 men in Florida were exempted to produce salt; and exemption was also made for those raising cattle because the Civil War had created such a need for beef. Florida was the largest supplier of beef to the southern war effort, and Volusia County sent tons of beef to the Confederacy. Yet I was taught that Volusia was not engaged in the Civil War. The Confederacy desperately needed war supplies–weapons, ammunition, and saltpeter for making gunpowder, so they sold cotton and turpentine in the British colony of Nassau to be able to buy military goods which they slipped back into Florida. The Union had captured all of Florida’s large ports (Jacksonville, Pensacola, and St. Augustine), and although they attempted a blockade of all inlets, Mosquito Inlet (Ponce Inlet) with its shifting sandbars became a prime site for the Confederacy to transport war materiel. Union ships were anchored along the coast to enforce the blockade, but shallow draft steamers “slipped like ghosts” in the night into Mosquito Inlet, carrying thousands of weapons, ammunition, and other war supplies which were quickly unloaded under cover of darkness by Confederates on the riverbank in New Smyrna at the ruins of the earthworks of the Seminole Wars-era fort and transported by wagon to Enterprise (near today’s Sanford and Deltona) where the goods were loaded onto boats and shipped on the St. Johns River to Palatka, then up the Ocklawaha River (near Silver Springs and Ocala) and freighted on the Fernandina and Cedar Keys Railway farther west to the Tallahassee area. The munitions and supplies were then sent by rail to Atlanta where they would be distributed to Confederate units; and on the return trip, cotton, turpentine, and tobacco were sent back to be sold for more arms. Knowing all this makes me realize that Volusia was vitally engaged in the Civil War. In the next blog I will recount the story of Volusia’s bloodiest Civil War battle. Charles Bockelman. Six Columns and Fort New Smyrna. DeLeon Springs, Florida: E. O. Painter Printing, 1985. Broward Liston. Waves of Challenge: A History of the Daytona Beach/Halifax Area. Dallas, Texas: Taylor Publishing, 1996. T. R. Townsend. “The Great Agricultural Advancement.” In Centennial History of Volusia County Florida, 1854-1954. Ed. Ianthe Bond Hebel. Daytona Beach, Florida: College Book Publishing, 1955. My wife and I are life time Volusia natives — Allan and Doris Tharp Gurley, 81 and 75 years. I did not know that part of our history… Thanks a lot.